It was nice to be in Compiegne and have the chance to look around a stylish town. Riding around with a ton of luggage on my bike was beginning to get on my nerves, and I worked out that I could get up early and go for a ride sans luggage, up to Pierrefonds and back, before then loading up and riding across to Chantilly. Very quickly after leaving the town of Compiegne the landscape changed from urban to the woodland of the Forest of Compiegne, and other forested zones. It was that time of day when those with jobs would already be at work, while those who would be taking things leisurely had not yet got up. So that meant I practically had these roads to myself. Pierrefonds village came around very quickly - it was only seven miles away on a flat road. At the castle things were fairly quiet, but I could see more and more coaches and cars turning up. This definitely seemed a popular place. 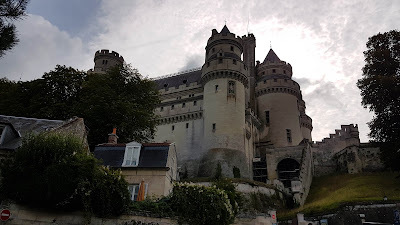 The first time I visited this area by bike, years ago, while trying to find Pierrefonds Castle, I bumped into an old local bloke. Even though he had lived in the area for over 30 years, he spoke about the castle with such passion and emotion like he was seeing it for the first time, and it was the most amazing thing. He described how this wonderful sight just rises from the ground, suddenly towering over you in spectacular style. At the time I didn't know what all the fuss was about. But at this moment when riding there I understood exactly what he meant. One minute I was on a a narrow road with a few houses, then the next minute the turrets of this massive fantasy-like castle suddenly came into view, completely dominating the landscape in the distance. The tower was clearly in view when in the distance, but then as I rode through the winding street that climbed uphill, the turrets disappeared out of view, only to become visible again when really close up. I took the opportunity to photograph this castle before the seriously big crowds arrived. At this time, on a Friday morning, there was only a handful of tourists and the area was populated by local people at the market. It all looked very French and traditional. Time was marching on, so I had to push on to return to Compiegne. This is such a lovely part of the world - if only I could have stayed longer. The practically empty roads only gently undulated through the woods, and the sun shone brightly. It was my ideal ride. Along the way, I passed an organised group ride of small children. They can't have been older than 7 years old. All of them wore high vis tabards, and there was a support car behind them like you would see in a professional cycle race. What a lovely introduction to cycling for this juvenile troop. As well as the Pierrefonds Castle there was also the Armistice Memorial, and a museum of the First World War. Unfortunately time ran out on me as my visit was embarrassingly interrupted by a phone call from a panicked Veronique. The landlady of my studio had returned home during her lunch hour to clear out my room (thinking that I had already checked out). Finding my belongings, but no sign of me she rang fretting about where I was! Once I dashed back she seemed more relaxed and a bit apologetic for making such a fuss. This panic from her was in addition to the fuss she had made the previous day when she dashed home from work, thinking that I would be at hers for 5pm, when in fact I didn't get there until about quarter to nine that evening. She was trying to juggle running the property while holding down her job, so I guess it must be stressful sometimes trying to get everything done on time. After a pleasant chat with Veronique and her son, I bade them good bye and toddled off along my way, headed for Chantilly. 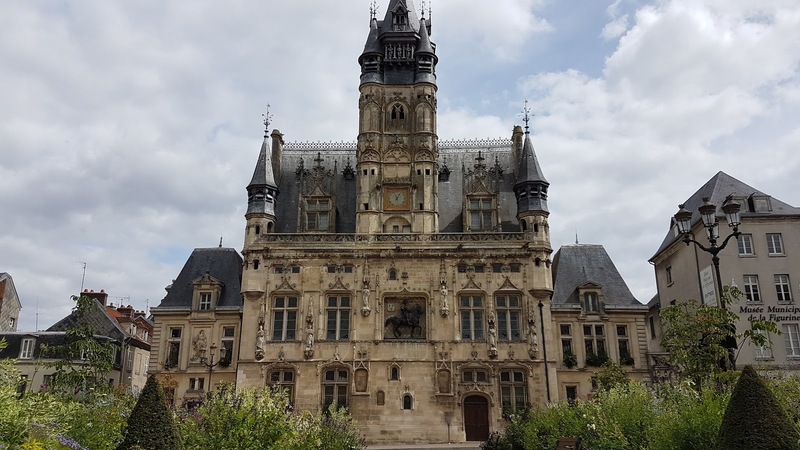 Before hitting the road for Chantilly I stopped off and took a few photos of around Compiegne town centre and its impressive gothic town hall that dates to the 16th century. This place definitely had an upmarket feel about it, with its timber-fronted architecture made the place look even prettier. 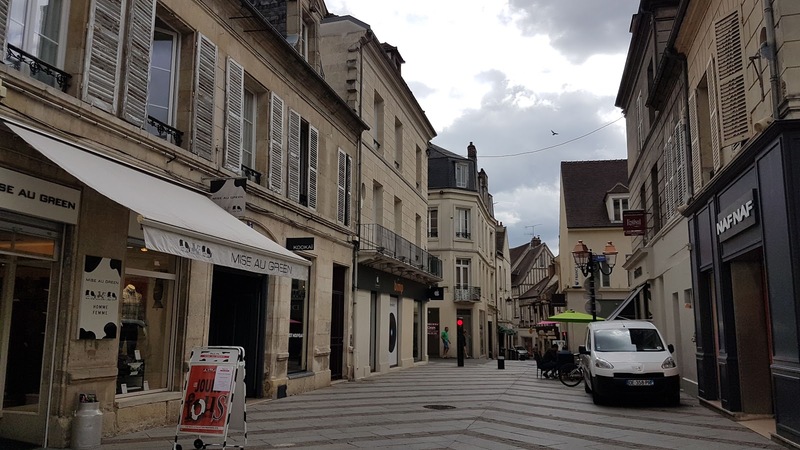 It had the feel of somewhere like St Albans or Stratford-on-Avon, and made for a nice start-town for those who have to face the 260-km cobble-strewn classic bike ride from here to Roubaix! If only, I could have stayed longer - but I had to push on to Chantilly. My ride to the town known as the Captital of the Horse, Chantilly, is highly recommended. Most of it was traffic-free or on quiet roads. The first part of the ride was on a tarmacked path that followed the river Oise. Then at Verberie, near Pont-Sainte-Maxence, I was then on a main road that had a segregated cycle path, and I continued along a rural road full of corn and pumpkins. It reminded me of my allotment, but just a gazillion times bigger! Looking at fields full of crops like this gives me so much admiration for the farmers, especially when I think about how much work I have to do just to maintain a 30sq metre patch of land, and they are responsible for 30 football pitches worth of produce. Again, this afternoon the roads seemed so empty, to the point that it made me wonder if I hadn't received the memo about something that was going on! In the end I reached a place called Senlis, and I realised that that the memo had been for everyone to go and have coffee in this beautiful ancient town. This must be one of the best kept secrets in France. I had heard people talk about Compiegne and Chantilly previously, but never Senlis. But in fact, I would say this town had more character than the other places. The buildings date from Roman times, and hark back to ancient times when royalty lived there. The place certainly had a historic with interesting facades, lining cobbled streets. There was a pretty descent smattering of luxury cars parked outside some of the cafes, as well as folks on Harley Davidsons. 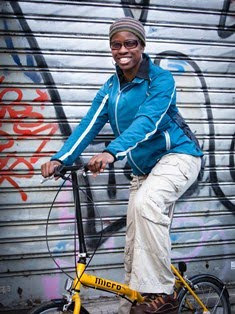 I was quite happy to people-watch on my old faithful Planet X push bike! By this time it was around 4pm, the sun had gone in and the sky looked quite threatening, so I quickly made tracks to Chantilly, which was about five miles away. Once again I was on a quiet, woodland lane. Google maps suggested I take a forest trail which followed quite the tributary River Nonette, but it would have been a bit too bumpy for my pannier rack and I didn't want to to take the risk. It turned out to be useful on-road rather than off-road because suddenly I got caught in a massive shower, which could have been a messy affair! Instead, I was able to stop on a recessed part of the road and shelter under the trees for around half an hour. Once the rain stopped my run in to Chantilly was straight forward as I basically followed the signs on what was the bike route of the triathlon, so the route took me straight into the grounds of Chantilly Castle, where I was able to pick up my race pack and start getting nervous about my challenge for the next day! 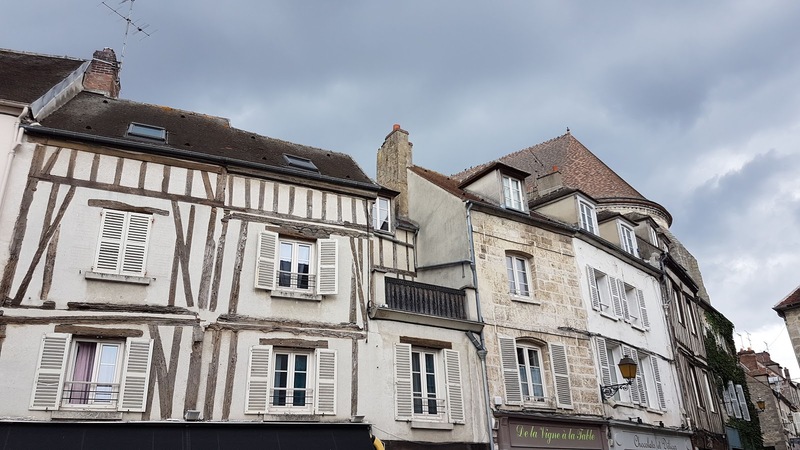 Click here for my route from Compiegne to Chantilly.